The Mount Pleasant Beef Group is a loose knit group of 15 producers ranging from Tungkillo, Eden Valley and Keyneton. It contains a mix of stud and commercial breeders with a range of breeds including Shorthorn, Angus, Simmental and Santa Gertrudis. 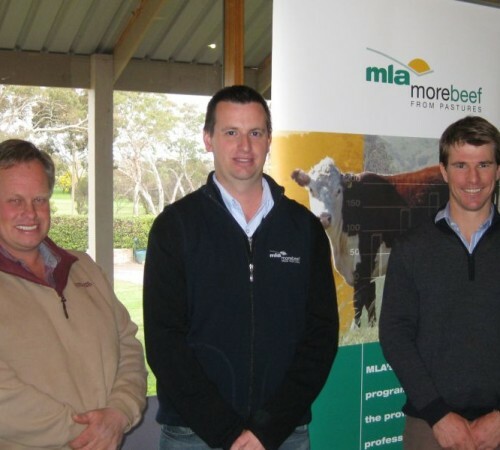 The group began as a result of an MLA sponsored Beef event in 2009 which facilitated the group networking and learning from each other. The group’s focus is on ‘increasing production and profit by lowering the cost of production while enhancing the environment and looking after people’. The group provide demonstration sites showing small pasture trials which are shared through the producer network in the form of pasture walks and newsletter articles.